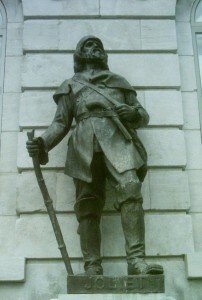 The French-Canadian explorer Jolliet (in company with the Jesuit missionary Jacques Marquette) set out in search of a water passage across the continent. Jolliet thought he had discovered it when he reached the Mississippi River, which he and Marquette explored from its confluence with the Wisconsin River to the mouth of the Arkansas River at the location of present-day Arkansas City, Arkansas. At this point, based on his own observations and reports from local Quapaw Indians, a disappointed Jolliet concluded that the river flowed south into the Gulf of Mexico and not west to the Pacific. Nevertheless, Jolliet and Marquette had paved the way for the French colonization of America between the Appalachian and Rocky Mountains.